FREE Kindle of THE MEMORY BOX!! Do you like free stuff? Of course you do! Well then, today’s your lucky day! 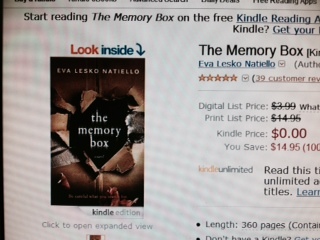 Actually, today through Thursday, July 31, THE MEMORY BOX Kindle edition can be downloaded for FREE! It don’t get cheaper than that, fine folks! So tell all your peeps, share the news, shout it from the rooftops. Or, if you’re afraid of heights, just send this post to your fiction-loving friends. Wait a second. Are you seeing what I’m seeing? Is that 4.8 stars from 39 reviews? Yes. Yes it is! Thanks to the amazing MEMORY BOX fans. Geez … you guys are awesome. Have I told you lately how much you mean to me? Thanks to everyone who has taken the time to write a review. I am incredibly grateful! Keep ’em coming! If you or someone you know, downloads a Kindle and reads this “unputdownable” “thrill ride” of a “page turner” hailed as the “best book of the summer” and a “great read for fans of Gone Girl” (I mean, that’s what I’m hearing…) please consider leaving a review on Amazon and/or Goodreads. That would make my day! THE MEMORY BOX Kindle on Amazon, free Tuesday, July 29- Thursday, July 31. Thank you so much, Eva. I can’t wait to read it! Me too, Jill! Thanks for reading! That’s wonderful! Thanks so much!